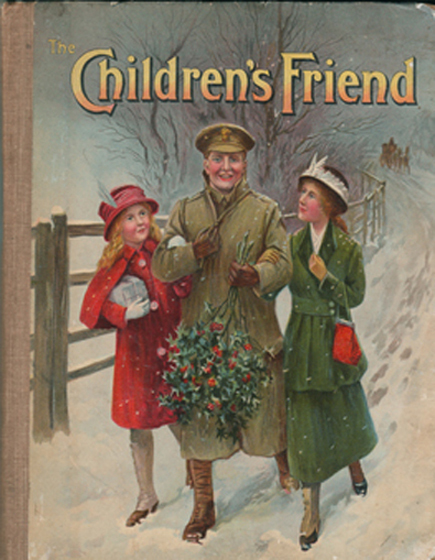 The Children's Friend Annual 1916 – W. Francis Aitken, et al. Author: W. Francis Aitken, et al. Publisher: S.W. Partridge & Co., Ltd. Description: Rare annual in relatively good condition for its age. The book has become unbound at the front, but remains intact at the rear. The binding is also relatively tight with no loose pages. Pages have yellowed and contain sporadic (and very light) foxing. The front and rear boards have some small chippings as well as the remains of some plain labels. Otherwise contents clean. Contents include: 15 short stories, 12 poems, and almost 40 works of non-fiction; numerous nostalgic adverts (e.g. Bournville Cocoa); black and white illustrations and photographs throughout (some of which are full-page); and four beautiful colour plates which are bright and in very good condition. Measures 10.2″ × 6.6″ (25.5 cm × 16.5 cm). 4to. 188 pp.